SnoWizard head Ronnie Sciortino in the company's New Orleans headquarters. New Orleans is famous for its delicacies: Po-boys, jambalaya, gumbo, beignets. But here's one you might not have heard of: Snoballs. From March to September, hundreds of shops in the city have lines of customers waiting to get their hands on this New Orleans tradition. The snoball (also spelled snowball or sno-ball depending on the stand) is a cup of finely shaved ice topped with fruit syrup. If you think this sounds exactly like a snow cone, don't you dare say that in New Orleans. The difference between the snow cone and the snoball is more than just a name. It has to do with the way the ice is actually shaved down into soft, snow-like flakes. The texture is achieved thanks to machines manufactured and sold in the Big Easy, most famously by SnoWizard -- one of the city's major snoball ambassadors. SnoWizard had some early competition, notably Hansen's Sno-Blitz, which has become one of the city's most famous snoball shops. Ernest Hansen -- along with his wife Mary -- founded the company in 1939 after developing his own machine several years before. "In other cities, people go to get cups of coffee," said current owner Ashley Hansen, who took over in 2006 after her grandparents passed away. "Here, they get snoballs. One of our busiest time is around happy hours. They're as popular with adults as they are with kids." In fact, snoballs are so iconic that Hansen's was named a 2014 American Classic by the James Beard Foundation. As for SnoWizard, Ortolano's nephew Ronnie Sciortino bought the company in 1981 and runs it with 12-14 employees. There's an actual SnoWizard stand on the infamous Magazine Street, but the company hub is a former car dealership in the city's outskirts. It's there that the company builds its machines, which it sells for $2,000 each (starter packages with flavors and cups can run as high as $10,000). The company ships roughly 400 a year to stands in all 50 states, Latin America -- even Saudi Arabia and Australia. While snoballs are gaining momentum across the country -- Sciortano says SnoWizard has had a 10% to 15% increase in product sales since Hurricane Katrina -- the fervor is unmatched in New Orleans. "Ordering a snoball in New Orleans is like ordering a ribeye steak," says Nick Pizzolato, who owns Pandora, a snoball stand that uses SnoWizard machines and many of its flavors. "People are just insanely particular about the way they want their snoballs made." Pizzolato and Sciortino said their shops can get between 200 and 500 customers on a summer day, paying $1.50 to $3 for a snowball. Some stands are even popular enough that the summer provides enough income for the whole year. 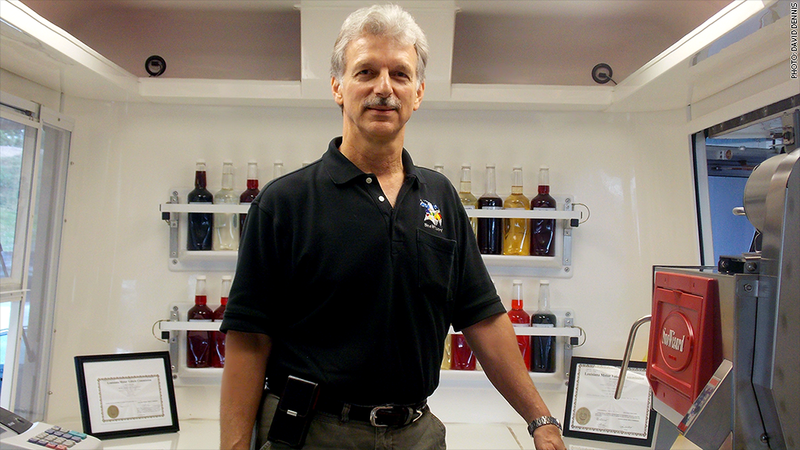 Sciortino personally mixes and concocts 150 flavors from the second floor of the SnoWizard building -- a room that looks more appropriate for Breaking Bad's Walter White. He's noticed people's taste for outrageous flavors are growing. Sciortino started getting requests for dill pickle flavors, which he found perplexing. He learned that at many snoball shops (which also sold chips, nachos and pickles), kids wanted the pickle juice poured over their snoballs. Stores started running out of the juice -- and a new menu item was born. And it's not just the flavors that are unique. Stands are increasingly creative about what they pair snoballs with: Condensed milk, cheesecake stuffed inside -- even apple pie on top. Still, the favorites remain, and they're institutions in New Orleans. "A few years ago, I tasted the strawberry flavor and knew I could make a fresher, more true flavor," Sciortino said. "But everyone was upset because they wanted the flavor they remember. I had to learn to leave well enough alone."